With the increasing number of contact points, from physical stores to e-Commerce, resellers and mobile applications, omnicommerce has now become a key element in business growth. For your business users, the management of product information is a real challenge (you might even say a real headache). With data "scattered" among providers or in different company departments, and having multiple sources and heterogeneous formats, this makes "data products" very complex. The decision to invest in a PIM solution is often spearheaded by Product Managers, Marketers and Merchandisers. Business users demand a PIM solution that is user-friendly and allows them to manage and to enhance product information and share it across channels efficiently. Product Data Management is still one of the retailer’s major challenges. Retailers need to offer their customers a rich and consistent experience regardless of channel or data set. The best way to provide customers with this unified experience is to propose a presentation of the production catalog that is up-to-date and relevant, no matter which channel they are using. The customer will not hesitate to repeatedly seek further information and ask for advice before buying, even for an in-store purchase. Data is the key to providing information to your customers. PIM stands for "Product Information Management". It is a tool or set of tools that helps you centralize and harmonize all necessary information related to your product catalog to enable you to publish product data to your channels. LET’S USE A PIM… OK, BUT FOR WHAT BENEFITS? With the shortening of product life cycles, being more agile and reducing time-to-market has become a major strategic factor beating the competition by being more agile. A PIM solution can significantly reduce the marketing time for a product, especially if it is used by all stakeholders and right from the product design phase. It allows information to be distributed in an organized way, regardless of the channel. Commercial information can thus be prepared and available, even before the product is ready for sale (Excel cannot do that). PIM solutions enable different departments to access relevant information in an organized way. They provide a collaborative environment for all stakeholders: marketers, product managers, translators… and with the use of workflow and access rights your teams will become even more efficient. With the explosion in the number of sales channels and in volumes of data, it is almost inconceivable, not to mention highly undesirable, for you to keep your product information updated using a tool that is unsuitable. The consequences of doing so can be hugely damaging: the highly negative effect of communicating two different prices for the same product is just one example. Your PIM allows you to instantly organize product data into a unified view and reproduce it on your various channels. Your PIM improves the accuracy of product data and consequently the rate of product returns decreases significantly, particularly in the clothing industry. "Up to 24% fewer returns amongst retailers, according to a PIM editor study." The quality of product information not only increases conversion rates but also reduces return rates. With good product information erroneous purchases can be avoided and costs for reversed logistics will decrease. We suggest you look at your current product management activities, identify possible improvements and the roles of stakeholders involved in the process, and assess those stakeholders’ needs. Business users must be involved in the selection of your PIM solution. As users of the new tool, they will be the ones facing daily issues with regard to keeping the product catalog updated, and they will help to optimize your processes. Keyrus Digital advises and accompanies you in your product management optimization process. We assist retailers with the PIM solution selection process (determining the detailed product evaluations and adapting the criteria weightings to fit their individual needs) and then with the next phase, namely the design of their future PIM. 1) What are your pain points today? List the pros and cons of your current solution or solutions used for product management. Look for what is missing to effectively manage your product data. 2) What type of products and how do you manage attributes and features? Define a product sheet model (Product attributes and Data features) but do not be locked into a fixed set of products. 3) Where does your data come from? Depending on your architecture, define your integration needs and which API and connectors you might require between your system and your future PIM (e.g. connect with your e-Commerce platform via WebServices). 4) Do you have specific needs? Some technical aspects may be provided out of the box by the PIM vendor and others might not be. Prioritize your specific needs over standard features that will not be used. 5) Who will use your future PIM? Those people need access to the PIM, maybe even from all over the world. 6) What are your channel management requirements? Are you handling different product descriptions depending on the channel (e.g. Mobile and Print)? 7) What are your needs with regard to controlling your data and measuring progress? Do you require dashboards to monitor your product catalog’s lifecycle and completeness? How would you like to measure the effectiveness of your PIM solution and processes? 8) Will the future solution manage digital assets? List the types of digital assets (JPEG, GIF, MPEG ...) and any treatment that should be considered for them (like resizing). Should an external party have access to images? 9) PIM: On premise or Online? Make the choice between outsourced PIM, (available via Internet on a remote server) and internalized PIM (installed on your corporate server). 10) What PIM solutions are available? It is useful to compare your needs against the standard functionality offered by publishers, but it is preferable to be given a demonstration and identify what is out of the box and what is not. 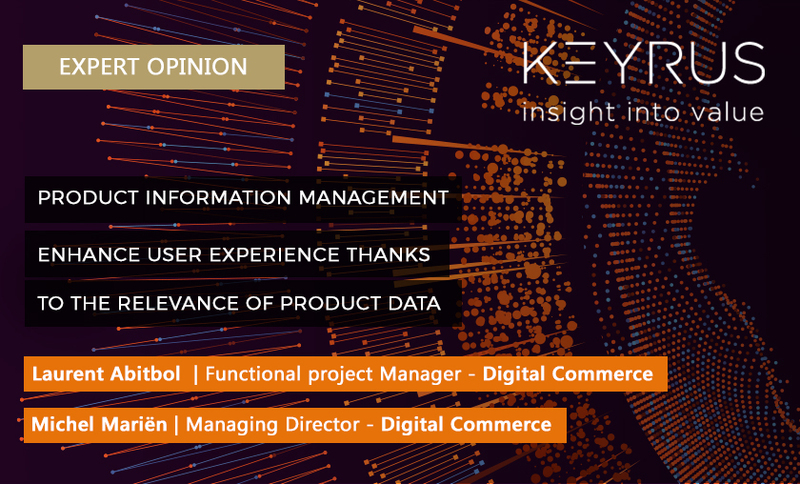 Laurent Abitbol is Business Analyst - Digital Commerce at Keyrus. During his career, he has accompanied major groups in the setting up and development of their e-Commerce platforms. Thanks to his experience in Digital Commerce, CRM and BI, he has acquired a true 360° vision of customers in a digital ecosystem. He joined the Digital Commerce Business Unit of Keyrus in 2014. Michel Mariën is Managing Director of the Digital Commerce competence center of the Keyrus Group. He is responsible for the French and Tunisian Digital Commerce business unit as well as for developing Keyrus's Digital Commerce skills centers throughout the world. With more than 15 years' experience of Connected Commerce projects, undertaken in a variety of business sectors and with numerous clients, including both those with local operations and others with a global reach, Michel is capable of meeting any challenge to make the most of its potential.